00:55:00 Makes 2 doz. or 24 servings, one bar (86 g) each. Makes 2 doz. or 24 servings, one bar (86 g) each. This super yummy treat has all the flavours of fall. We've started with a boxed cake mix to save you time (shhh!!!). 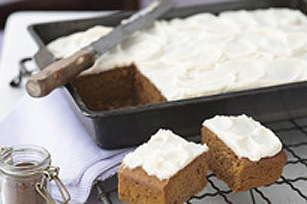 A few added tweaks give a moist and extremely flavourful spice cake. This icing is…well…the icing on the cake! Creamy, slightly sweet, and the perfect complement to the cake below. Bake 32 to 35 min. or until wooden toothpick inserted in centre comes out clean. Cool completely on wire rack. Beat cream cheese, butter, milk and vanilla in large bowl with electric mixer on medium speed until well blended. Gradually add sugar, beating after each addition until well blended. Spread over cooled cake. Cut into pieces to serve. Store any leftover bars in refrigerator. Prepare as directed, using 15x10x3/4-inch baking pan and decreasing the baking time to 20 to 22 min. or until wooden toothpick inserted in centre comes out clean. Stir 1/2 tsp. grated lemon or orange peel into the frosting. Sprinkle top with grated orange or lemon peel. Serving Size Makes 2 doz. or 24 servings, one bar (86 g) each.